I had been to CII through Yi Interactive for attending an interactive session with Mr. Kumar Iyer, British Deputy High Commissioner to India & Director General, UK Trade & Industry. Along with Mr. Iyer we had Mr. Milind Godbole, Sr. Trade & Investment Adviser, British Deputy High Commission Mumbai. The objective of the interactive is to facilitate trade relationship between UK and India based Small and Medium sized businesses. Mr. Sukbir hosted the event and began with asking questions. He asked questions about visa, taxations and so on. 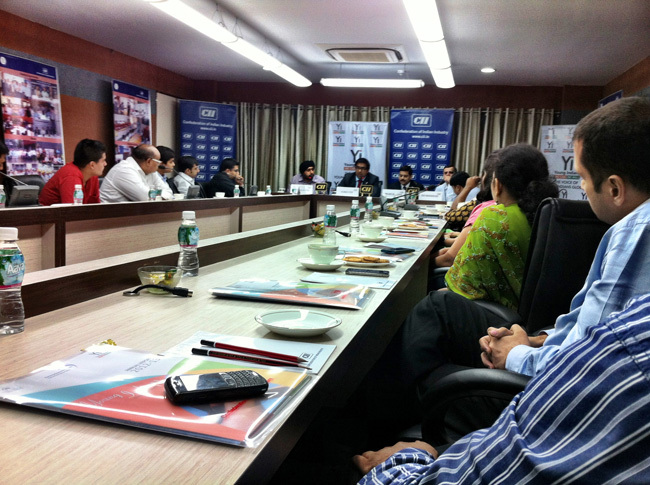 It was an informative Questions and Answer session and the insights we got are valuable. I got a chance to chance to interact with Mr. Iyer who is responsible for UK & India relations with commercial background and prior experience into Management Consulting. It was pretty interesting to learn about Mr. Godbole’s background. He has helped several Gujarat based companies to setup there office and operations in UK, so if any small and startup company like us is wanting to expand there marketed in UK he is the person to contact. Mr. Iyer addressed all new young entrepreneurs as “TATA’s and BIRLA’s of tomorrow!” and that brought a lot of energy on floor. For me, take home point was how the UK thinks about products and services, which was “If you need to grow your business in UK you need to focus on Quality, Relationship and Trust” and for getting those in place they are okay to pay and charge a premium price.